When our Lab mix Luke was diagnosed with patellar luxation in both of his back knees, we had to come up with a plan of action to avoid surgery, or at least to be able to put if off for as long as possible. Once he was through his recovery period we made the decision to just let him play like a normal one+ year old dog. This boy wants to walk, run, climb, jump, and play as you’ll see him doing in the photos throughout this post. If that leads to surgery being needed, so be it. We’ll simply do all we can to help him avoid it if we can. The plan of action included having him lose a couple of pounds (which we more than accomplished, and more about that in another post), keeping him moving to strengthen his leg muscles, a healthy low carbohydrate diet, and the addition of joint supplements. At the time we had just switched Sheba to a different supplement for her arthritis (it had worked, but she no longer seemed to like it), so we started Luke on what we had left of that. There was improvement seen, but not as much as we’d hoped for. So when a blogger friend recommended the supplement Rejenease and put me in touch with Steven at that company, we decided to give that a try. Steven has been great to work with, he’s been very patient with us, and I believe he reaches out to all of his customers to be sure they are satisfied with the product. It’s been a rough winter here, and that has to be hard on all of the dogs’ joints. Trudging through feet of snow, or slipping on ice have been the norm. At first we didn’t see a big change in Luke, I would still see him holding up his hind leg because his knee had popped out. A couple of weeks into trying Rejenease I realized my husband, who does most of the feeding around here, wasn’t giving Luke the proper dosage. Luke was supposed to get this twice per day, and he was only getting it once (which is how their other supplements are given, so understandable). Now that we’ve fixed that, over the subsequent two weeks I have seen an improvement. In fact, it’s been days now since Luke’s knee has popped out. I do want to point out that our deep snow is packed down now, and that could also be a factor. But even when I took Luke snowshoeing and he trudged through the deep snow in the woods at times, he was still doing fine afterwards. The first thing I was impressed with when we received this product was the size of the bottle. It is a 32 oz. bottle, and at a dosage of 3 tsp per day for Luke, this will last us 2 months! At the price of $39.95 per bottle, with free shipping, I think this is a great value. Most importantly, Rejenease is a liquid so is easy to add to Luke’s food and he likes it. Glucosamine & MSM to build & protect joints. Chondroitin to improve elasticity & flexibility of joints. Hyaluronic acid to lubricate the joints. It is made in the USA with human grade ingredients, in an FDA inspected facility. It comes with a risk free guarantee. If you don’t see the desired changes in your dog within 30 days, you can get all of your money back with no questions asked. And now for the best news! Steven is very generously letting us give away 5 bottles of Rejenease to our readers! Just fill out the Rafflecopter below for your chance to win. This giveaway is open to USA residents 18 years of age or older only, and void where prohibited by law. It will be open for one week. If you don’t want to wait to win, I have also been given a discount code you can use to purchase your own. Just click this link to order from amazon.com, and enter the discount code WAG1WOOF at checkout for 25% off your first order! If you would like more information about this product, you can visit their website by clicking here. *Disclaimer: We were given one bottle of Rejenease to try free of charge, but were in no other way compensated for this post. 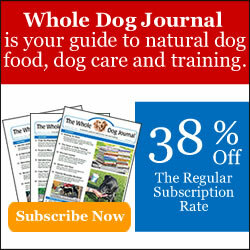 Wag ‘n Woof Pets only shares products we believe in, that we think will be of interest to our readers. All opinions are my own and are completely honest. I have only had to use pill and powder form with the dogs and I find the pill form works best. I’d love to try this with my 3 senior dogs 🙂 Sounds like a great product and I’m happy it’s helped Luke. I think you’ll find the liquid convenient to deal with as well. Good luck!! Liquid or powder because then it’s easy to mix in with a bit of water and the dry food. I agree….wrapping pills works fine, but being able to just add it to their dinner makes for one less step. I’m so glad to hear Harley will be trying this! He’s definitely going to need to stay healthy in order to keep up with that puppy! My Kota likes his joint meds I give him cause they are almost like treats. If he didn’t like them just put some hamburger around it and he would take it so the pill would be the way to go for him. Hamburger or cheese are always our “go to” wraps for meds…works like a charm with our crew! Good luck in the giveaway, Ruth, I hope you get a chance to try this and that it works for Layla. I’m so glad you’re seeing such improvement in Luke! We’re using Rejenease with Jeffie and his torn acl (waiting for better weather to do surgery) and I just ordered a second bottle last week. I’m glad it is helping Jeffie too! Sorry to hear about his torn acl though, hope the surgery goes well. Thanks Jan for your wonderful review – it’s great to hear that Luke is responding so well. Thanks everyone for your supportive comments – they really mean a lot to me. You are so welcome, Steven! We are so grateful you gave us the opportunity to try this. I’m getting a good report from my sister now as well, so I’ll be writing about her beagle soon too! I think the liquid is so easy since Nellie eats it up no problem it beats shoving a pill down her throat. I am going to use your discount code and get another bottle and also try and win one as I really like this product and am going to keep Nellie on it. You are right Steve has been so great to work with. I’m glad Luke is doing better and here’s to no surgery. Great review! We’ve done it all three ways with the dogs, and I also think the liquid is easiest. I am just so glad that so many dogs have been doing so well on this, and that Steven has been so generous in providing discounts and giveaways! Any savings is such a help, especially when you have multiple dogs like you and I do. I’m so glad it’s helping Luke! Since I started Callie on it in January, she has really been more comfortable. She has even been counter surfing again from time to time! I have to order my 3rd bottle of it soon. I might use your link; but then again maybe not, since I’ve already used Jodi’s link for the discount on my 2nd bottle. Steven has been great about keeping up with me about Callie. I don’t want to take unfair advantage. I know what you mean. He sent me a discount code for my 2nd bottle too, but after that I’m not sure if I’ll use the code. He has been so generous already….he also gave a bottle to my sister and a friend (I’ll be writing about how their dogs are doing on it as well). I’m so glad this is working for Callie too! So happy you found something to help Luke. Here’s hoping he puts off that surgery for a long time. Thanks for joining the hop! Thank you….we sure hope so too! It will be much easier to do when he’s a bit older and quieter (unless he’s like the girls and never really gets quiet….lol). I think the easiest is a pill hidden in her food. We’ve used that method a lot too….cheese or a wad of burger has always worked great for us. There are good and bad points to having dogs that aren’t picky, right?! I wish we had started our older girls on something sooner. I think if you have an active dog, especially of a breed that’s prone to joint issues, it’s a great thing to start early. We’re glad to hear that the Rejenease is helping Luke. Is there a cat version? Sorry – there isn’t a cat version yet. Thank you, Island Cats, and thank you Steven for fielding their question! Katie is doing real well on this and we are thrilled it works, isn’t sooo expensive and is a large bottle! I’m so glad it’s working for Katie too! I really think it’s a great value. My sister is using it for her Pug. We think its making a difference. I’d love to try some for Nelly! I’m so glad to hear it’s helping someone else too. Good luck in the giveaway! This stuff sounds great! Scout sure could use some! We are so happy it’s been helping Luke. Good luck…hope you get a chance to try some for Scout! Yay! Glad you guys got to try some of this stuff. I am so glad to hear that it seems to be helping Luke too!!! Thank you, Jenna. Sorry you couldn’t enter the giveaway. Probably a powder if it doesn’t have too strong a taste so I can just mix it in with his food. I think something that can be mixed in with food is definitely easiest. Even if you have picky dogs, they might not even notice it.